The King County administration buildings at 420 and 500 Fourth Avenue in downtown Seattle will add 50 more beds on Thursday and Friday nights for men 18 years and older. Update, Friday 1:37 p.m.: The city of Seattle confirmed the Seattle Center shelter will stay open until Monday morning, with the Seattle Urban League staffing. All genders are welcome. Western Washington has had a record cold week, with snow dusting Seattle, and while temperatures are going up slightly this weekend, meteorologists say it’s going to be wet. For now, Seattle’s cold-weather shelter at Seattle Center won’t stay open after Thursday night, according to the city. 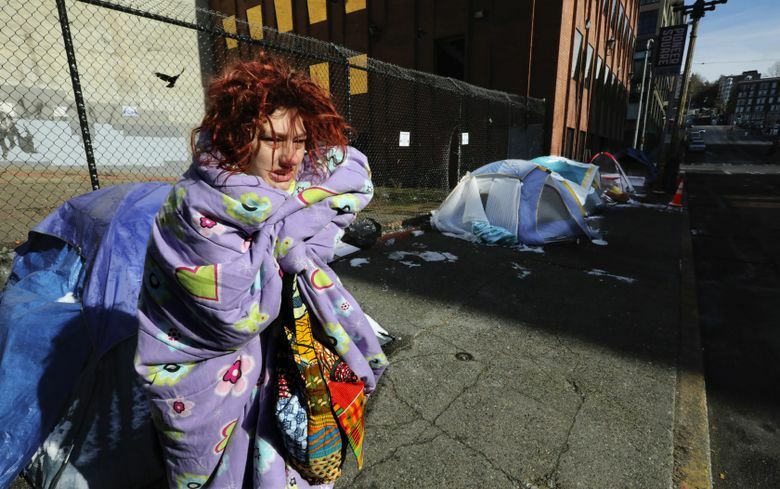 Nonprofit staff who are able to run a cold-weather shelter are stretched thin, and the city hasn’t yet been able to secure anyone to keep the site open, according to a spokesperson. The city had to turn to Seattle’s Urban League to keep the shelter open this long, but they’re working to keep Seattle Center open for the weekend. Seattle’s Salvation Army shelter at the Northwest William Booth Center is currently closed, according to 2-1-1’s website, and Kent Housing and Human Services’ severe-weather shelter won’t be open this weekend. In other parts of King, Snohomish and Pierce counties, cold-weather shelters say they will open if the temperature drops below 32 degrees. In the meantime, the King County administration buildings at 420 and 500 Fourth Avenue in downtown Seattle will add 50 more beds on Thursday and Friday nights for men 18 years and older. They don’t provide meals or hygiene services, but service animals and pets are allowed. Intake begins at 7 p.m., but men often begin lining up before then. The shelter closes at 6 a.m.
You can find updates to the list of cold-weather shelters here and a list of overnight shelters here. For information on other shelters, call 2-1-1.